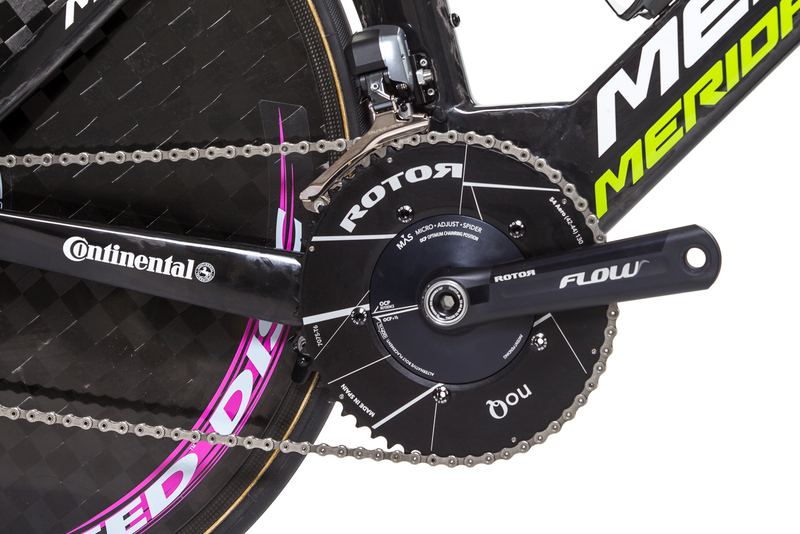 For a long time, Merida has not been actively involved in the resource-intensive competition for the title of fastest time trial bicycle, in which the world’s most important manufacturers carry out bitter struggles in their wind tunnels for every gram of air resistance. This battle often resulted in intricate, complicated and expensive high-end machines that were unsuitable for everyday use, that annoyed any mechanic and that frustrated customers. 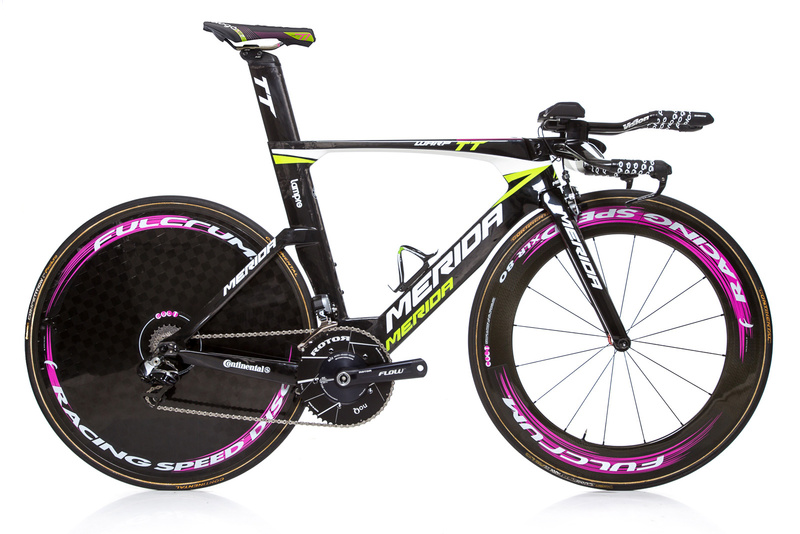 Merida cleverly avoided this conflict and concentrated mainly on their mass-market-suitable triathlon bikes that were not homologated by the UCI. This situation changed rapidly in early 2013 when the Taiwanese announced their commitment as a title and material sponsor of the Lampre-Merida team. 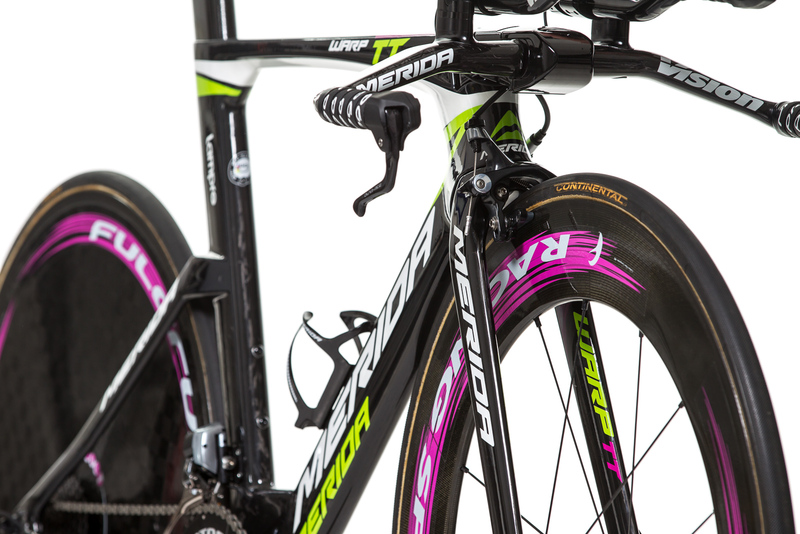 With their entry onto the UCI Pro Tour scene, Merida was intensively induced to provide the Lampre-Merida pros with a TT bike that was just as competitive as the Reacto Evo. For months, Jürgen Falke’s development team sketched, built, tested, and discarded designs until they had found the optimum compromise between aerodynamics, geometry, stiffness, weight, and handling characteristics, including obtaining UCI approval. 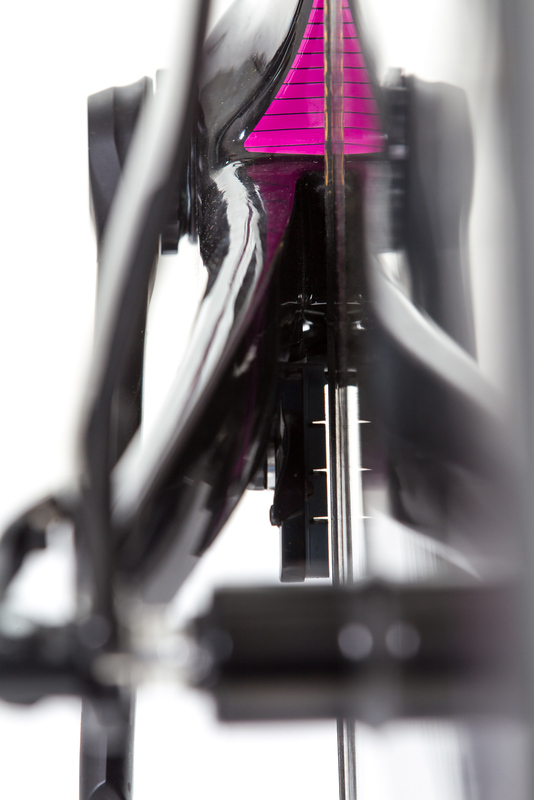 After extensive wind tunnel measurements using rider dummies and team riders, the Warp TT was officially inaugurated in spring 2013 as part of the presentation of the Lampre-Merida team on Mallorca. 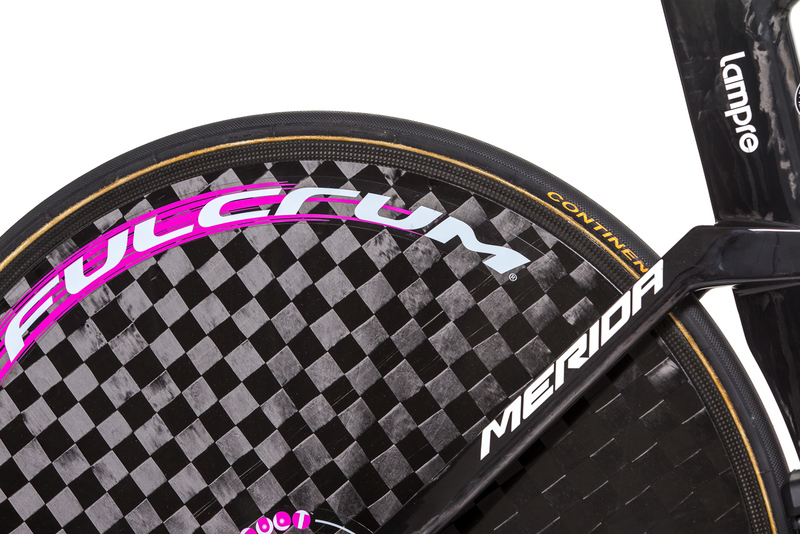 Now that the modern carbon fibre powerhouse has two full seasons behind it, it has received a few minor design changes and modest hardware updates for 2015. In summer, we had the unique opportunity to test the prototype of the 2015-model pro bike for three months; naturally, we made the most of this. 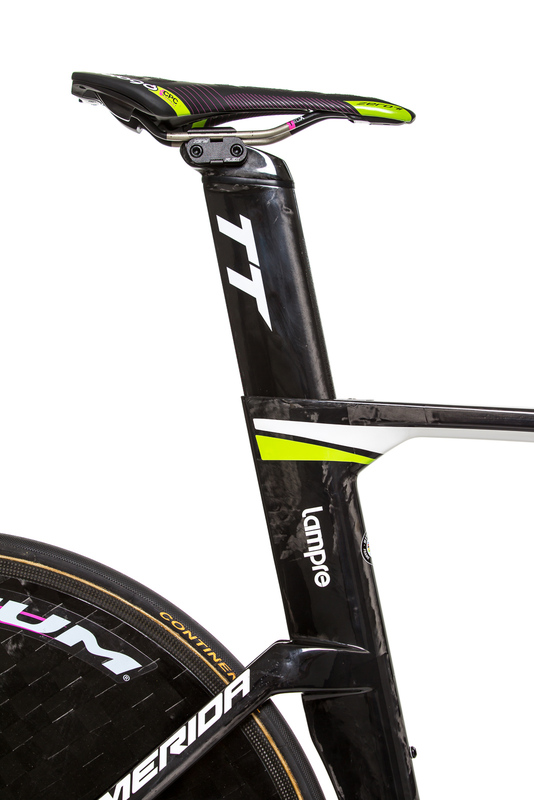 The Warp TT has the shape of a purebred time trial bike. 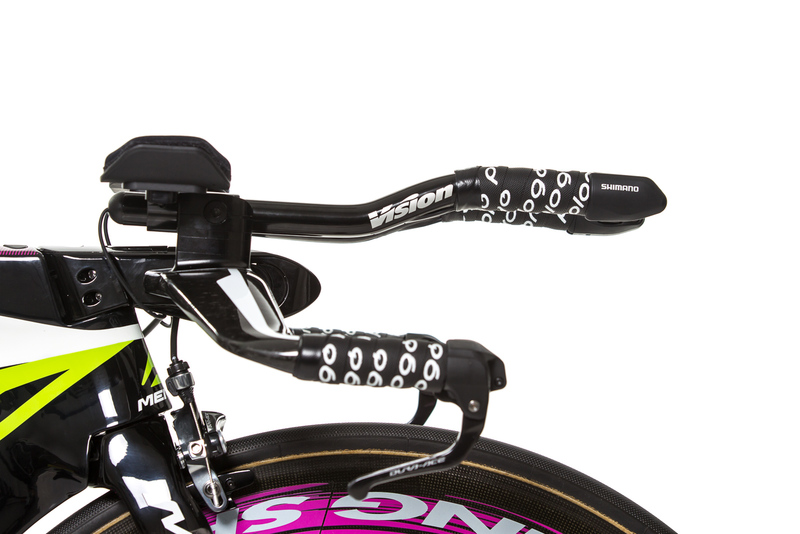 In addition to the relatively shallow seat tube angle of 74-78.5°, which permits a seat position of at least 5 cm behind the bottom bracket (UCI rule 1.3.013), the extremely low cockpit, with a horizontal stem and low arm pads, is equally responsible for this. Thanks to the “Modular Head” system, the effective length of the steering tube can be extended by 30 or 60 millimetres using special inserts. 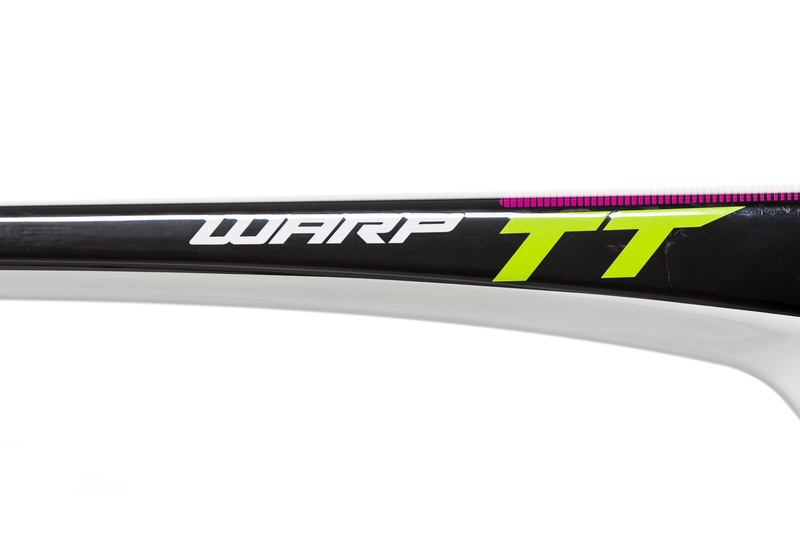 Therefore, the Warp TT can also be used just as well over short and medium distances. “We were not trying to build a universal bike that was suitable both for short time trials and for long distances. 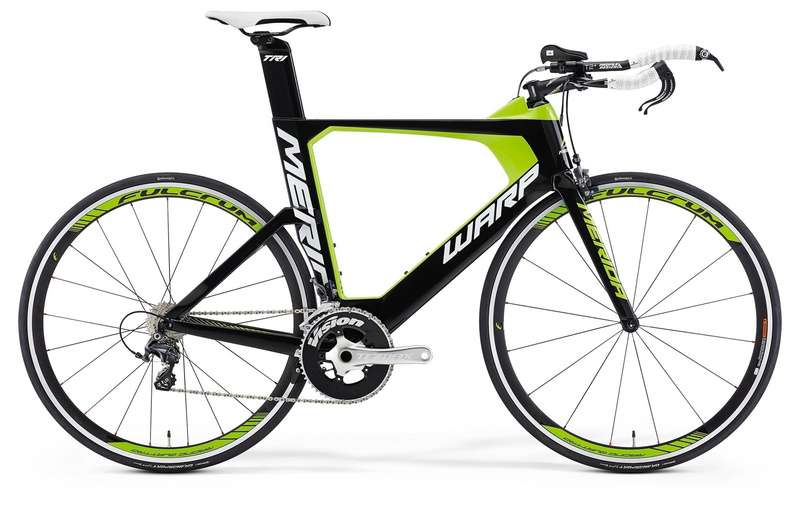 Starting in 2015, we have added our new Warp Tri, which has a true long-distance geometry, to our range for the very important triathlon market” says Daniel Schwenk, one of the engineers for both models. 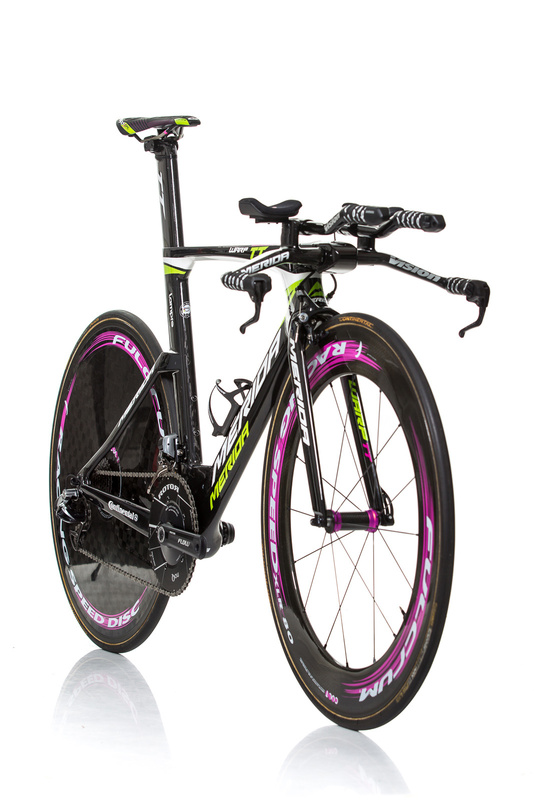 Apart from the tube-type tyre wheel set, the Pro Tour bike’s equipment is absolutely identical to the commercially available Warp TT Team-E. 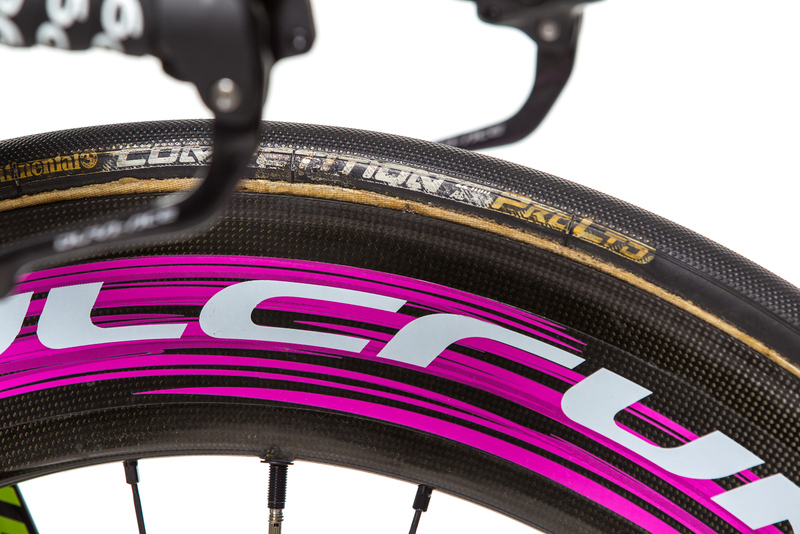 While the pros thrash the Fulcrum high-profile disc wheelset over the asphalt on narrow Conti Competition ProLtd tube-type tyres, the speedster for everybody has Red Wind XLR 80 aluminium clinchers made by the same manufacturer, including comfortable mass-produced GP 4000S 23 wired-on tyres. I feel sorry for these lightweight pros, especially on poor ground surfaces or in strong crosswinds. Although there’s nothing wrong with tubulars in terms of weight, stiffness, ceramic bearings, and rolling resistance, the narrow V profile is no longer up to date, responding with a sudden jolt to every gust of wind. In addition, the rigid front wheel makes the front of the bike seem harder than it actually is. 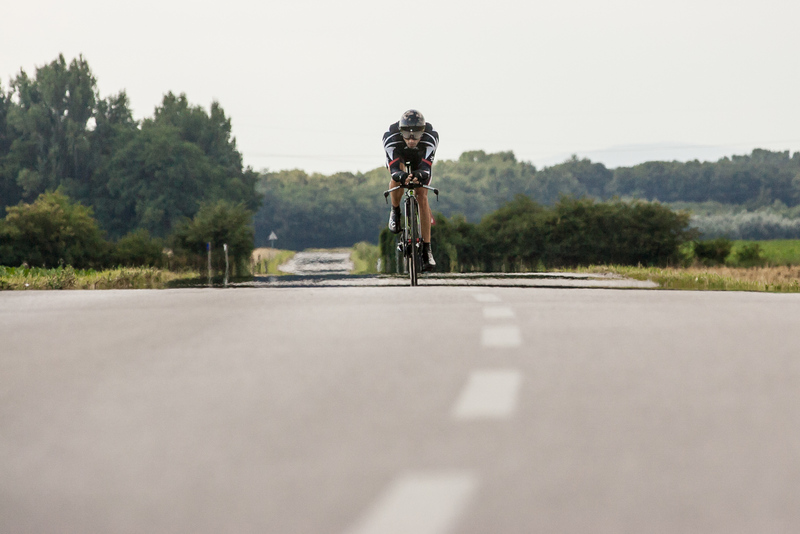 "It is the combination of optimum aerodynamics of the bicycle and of the complete system, including the rider and the machine, that decides between victory and defeat during time trials." The frame is made of high-quality “Nano Matrix” carbon, in which special nanoparticles are added to the carbon mats to strengthen the epoxy matrix. 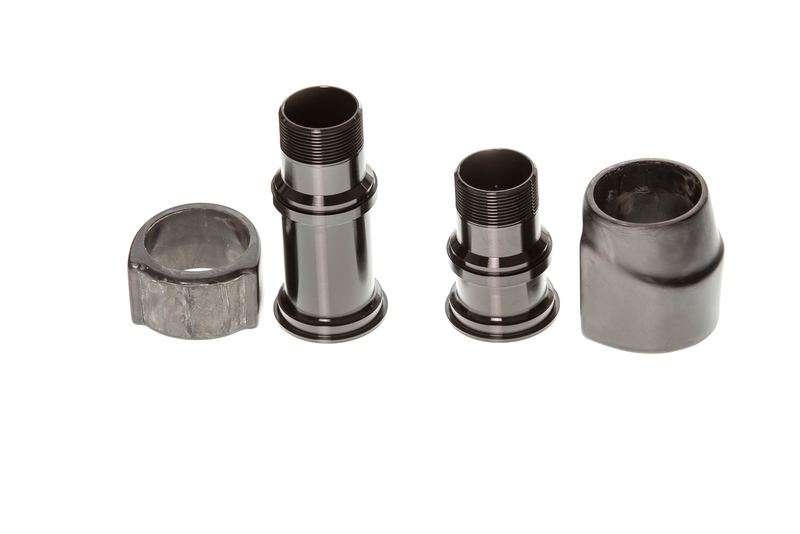 This increases the impact resistance by up to 40% compared to conventional carbon materials. Inside the frame, specially shaped inserts (“Anti Wrinkle System”) that are used during the manufacturing process reduce the number of wrinkles and thus excess material, keep the weight as low as possible and provide high stiffness. The complex shape of the frame structure has a sophisticated system for internally routed electronic or mechanical shifting cables. Merida also took hydraulic brake lines into account so that conversions or additions do not become a major difficulty for a mechanic. In order to save time when changes are frequent, all of the cables can be routed externally during an analysis of the sitting position. 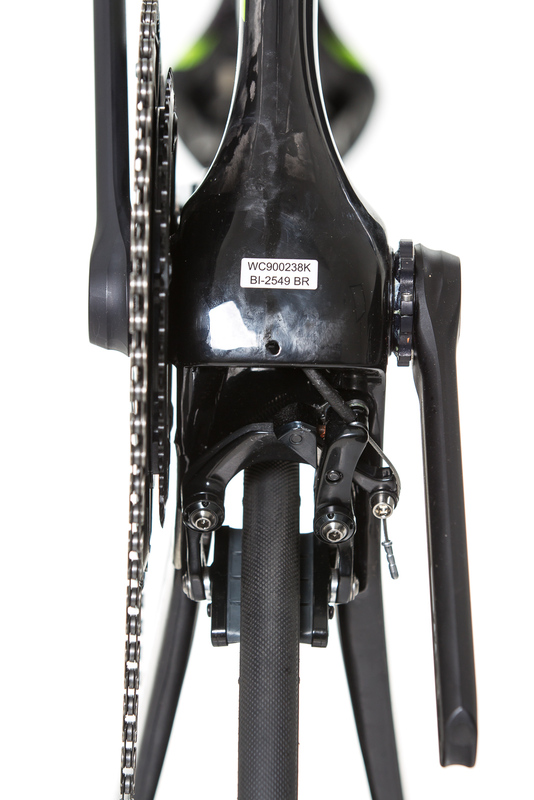 A robust and fully integrated steering stop in the lower steering head area prevents the fork and the handlebars from colliding with the carbon frame; however, it significantly limits the steering movement. Even though this is not a deficit during sporty riding, it nevertheless makes manoeuvring in tight spaces difficult, which is also the case for the balancing act at the traffic lights. 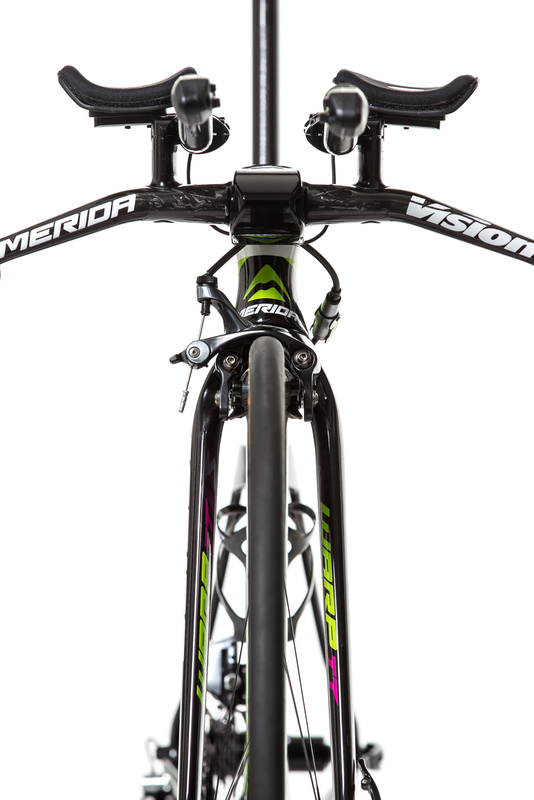 To comply with the UCI 3:1 rule – the length-to-width ratios of all frame parts may not exceed 3:1 – the Merida engineers decided on a “Fastback” profile, whose truncated drop shape lets oncoming air slip past optimally without turbulence. 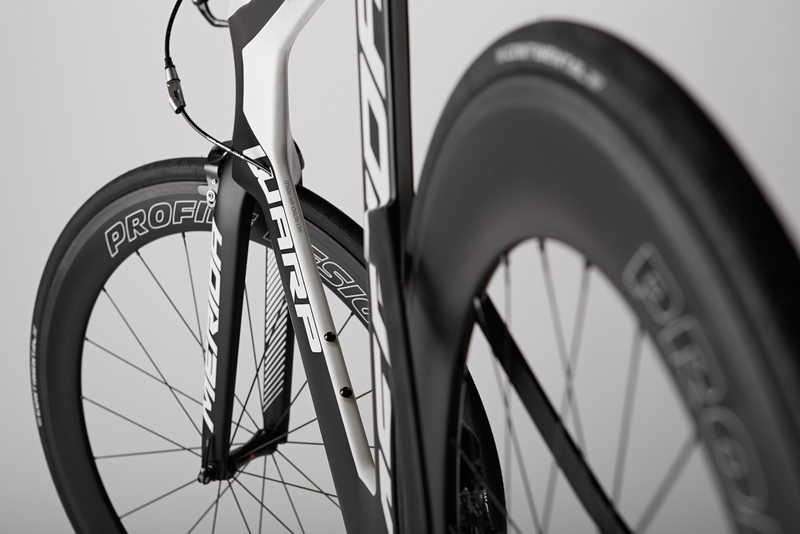 The final shape of the frame is a result of countless simulations and wind tunnel tests. These also showed that a very wide fork, with a blade distance of more than 60 mm, has measurably better behaviour in terms of air resistance. So both fork blades and the wheel are subjected to separate streams, which excludes negative turbulence caused by overlapping of the individual air currents. 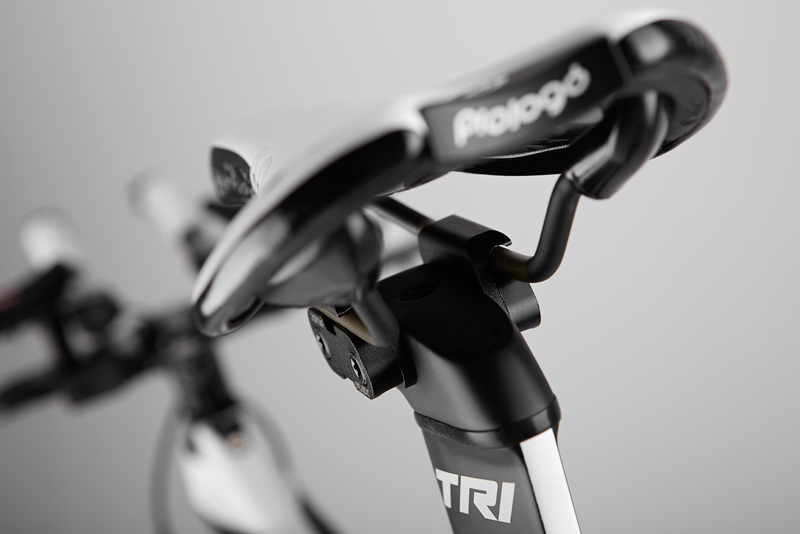 The difference between a fully integrated and aerodynamically optimized hydraulic brake and Shimano’s Direct-Mount front brake was 1-2 watts, which is relatively small. 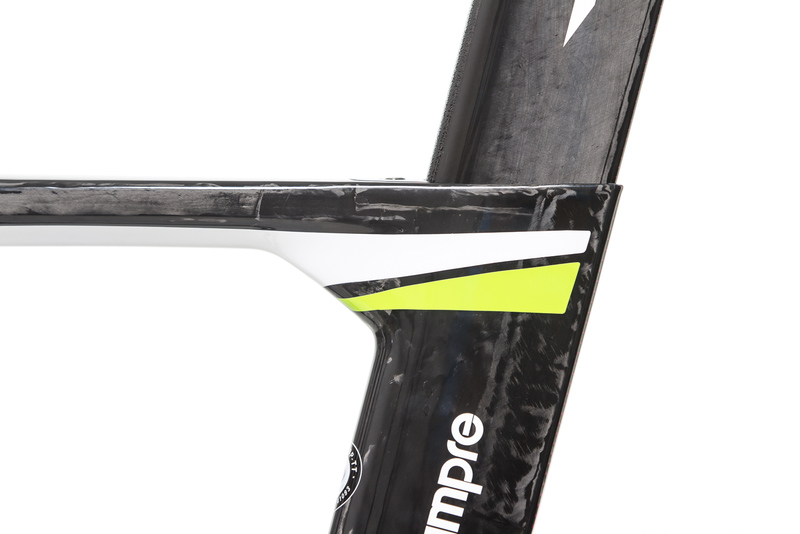 The aerodynamic post has a shape like an aerofoil, becoming narrower towards the back when seen from the front. However, the seat angle can be varied from 74 to 78.5° to set the optimum position. To do this, not the complete post is rotated 180°, but rather only its “Flip Flop” head. The Di2 battery is located inside the post and is thus optimally protected from wind and weather. 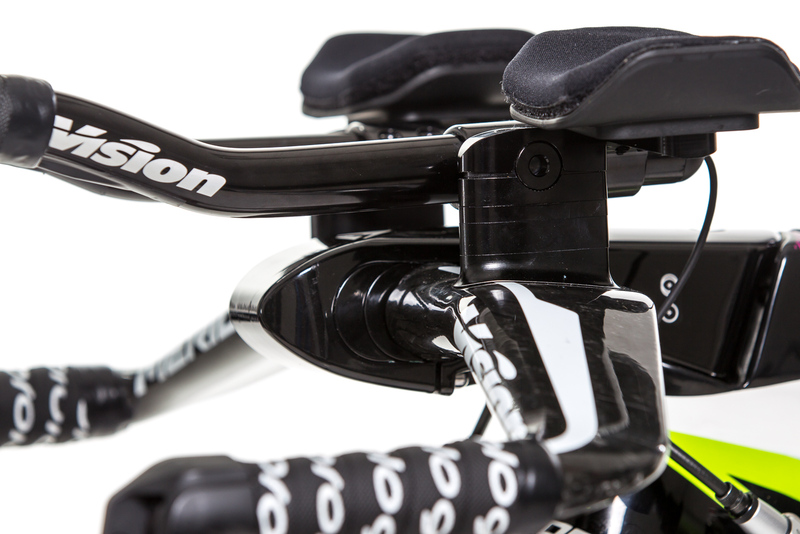 The fully integrated seat clamp is more than merely a visual highlight. It reduces the turbulence on the top tube to a minimum and has a high degree of everyday practicality thanks to good accessibility and a durable screw. After screwing for a few threads and applying steady pressure to the top of the screw, the height of the seat post can be adjusted with virtually no friction. 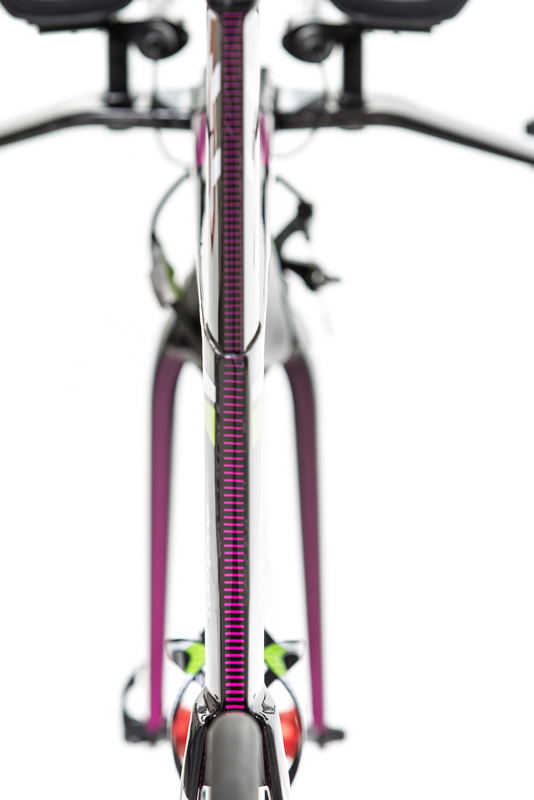 To also make the Warp TT fit for short and middle distances, Merida offers its “Modular Head” system, which gives riders the opportunity to extend the effective steerer tube length from 0 to 30 or 60 millimetres using special inserts. In contrast to a solution using spacers, which in the best case does not adversely affect stiffness, this stiffness actually increases in the WARP TT because the inserts increase the support length. 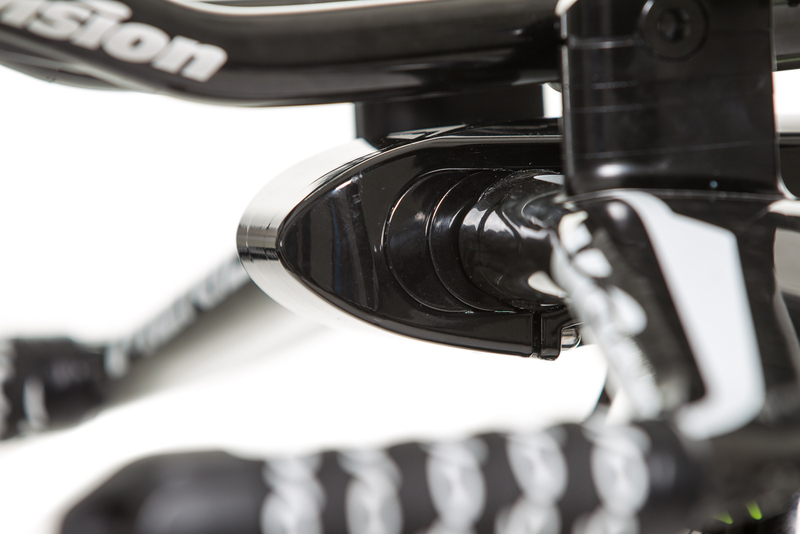 A higher position of the steering unit works only with a full-length steerer tube. As our test bike’s had already been shortened for a race position, subsequent extension was no longer possible. This is entirely an in-house development that is produced at Vision/FSA at the behest of Merida. The hollow-machined aluminium stem has the patented Stem Adjustment System of Swiss engineering prodigy Andy Muff and offers maximum adjustability as well as good aerodynamics, with optimum accessibility of the screws. The length of 90, 100 or 110 millimetres is adjusted by positioning two integrated spacers without having to remove the stem or requiring screws of different lengths. In addition, all brake and shifting cables run together in its interior; a skilled pair of hands can even stow the Di2 junction completely in the stem. 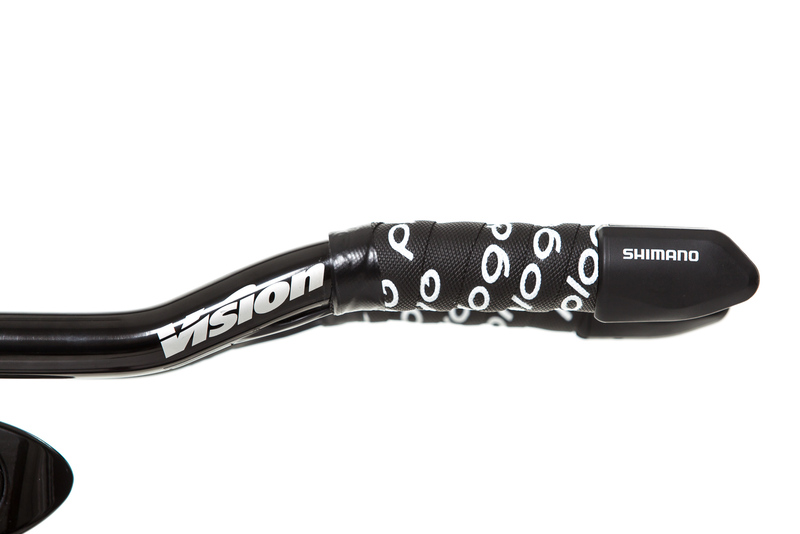 The stiff flip-flop basic handlebar is available with a width of 400 or 420 mm and with two offsets of 35 or 15 millimetres. Its oval receptacle facilitates precise horizontal orientation, making it 100% rotation-proof. 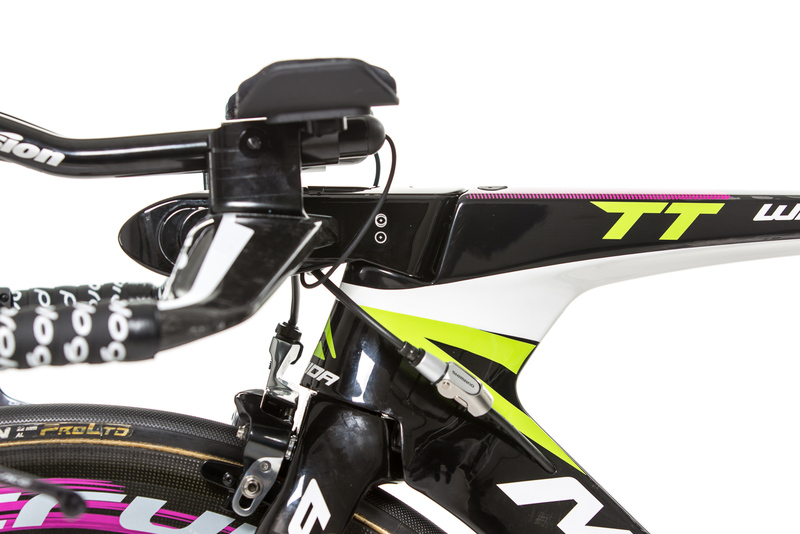 As is the case for the Warp TT stem/handlebar combination, the direct interface with the rider comes from the mind of a Merida developer, is exclusively manufactured by Vision/FSA and permits an almost infinite variety of settings. 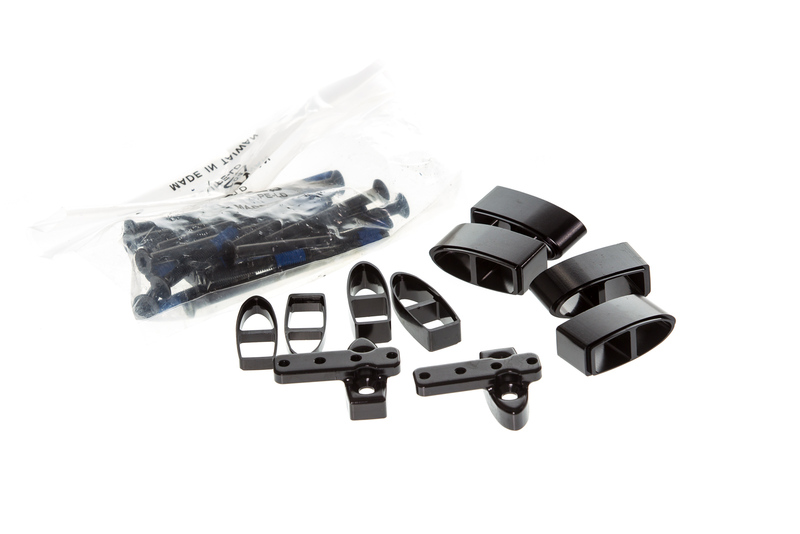 For example, the extensions can be mounted above or below the handlebars, depending on requirements. Furthermore, their inclination can be adjusted. Many holes on the handlebar and the armrests, along with different spacers, allow very flexible height and width settings. 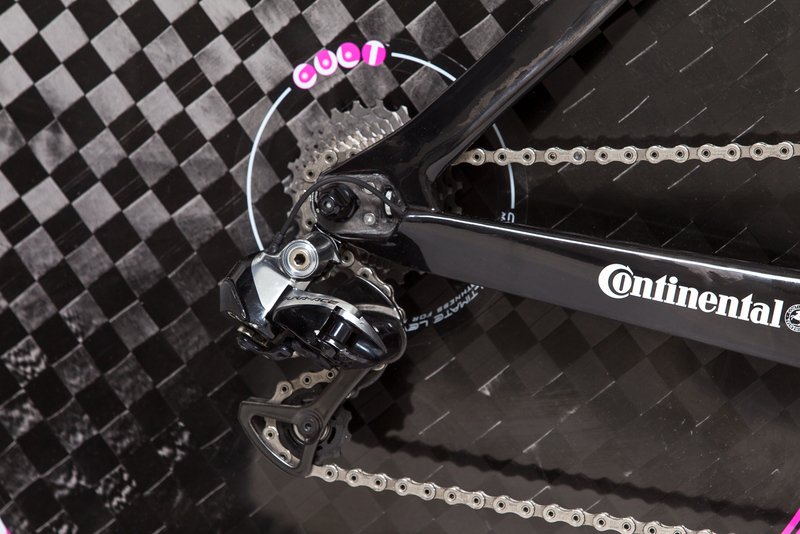 The Warp TT frame has a massive Oversize-BB86 Pressfit bottom bracket housing (86.5 x 41 mm) that is fully compatible with the most popular cranks and performance measurement systems on the market: Hollowtech II cranks with a 24 mm diameter spindle (Shimano Pressfit 86), SRAM GXP (Truvativ PressFit GXP) or BB386Evo cranks with a 30 mm spindle (Rotor PressFit 4130). Only classic BB30 cranks do not fit because their spindle is too short. 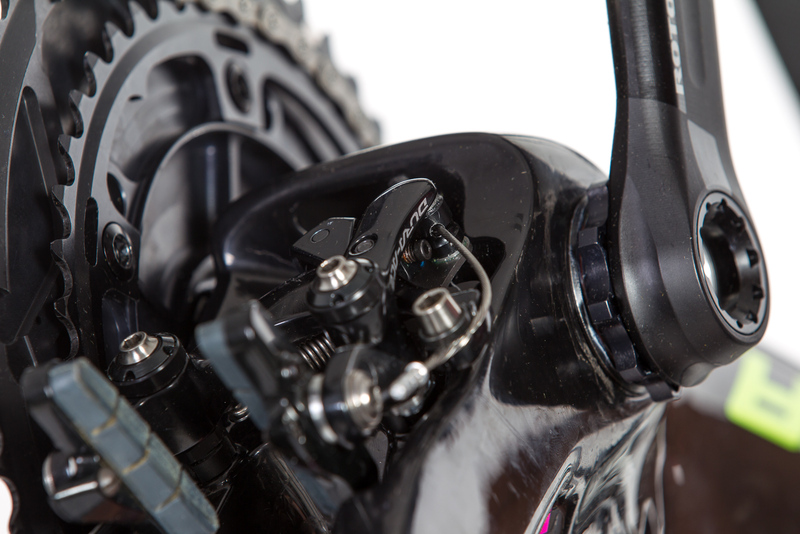 Unlike the competition, Merida put their faith in the functioning of Shimano Direct-Mount brakes both front and back. 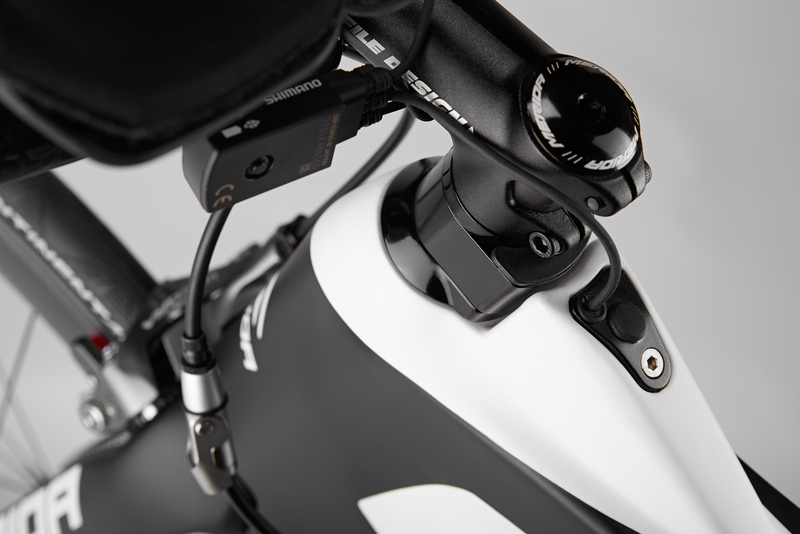 The semi-integrated Dura Ace stopper ensures both rapid adjustment of the cockpit – without complex routing of hydraulic brake lines in the interior – and electronic switching using Shimano Di2 brake levers. Furthermore, the width of the brake callipers can be quickly adjusted, the easily accessible pads are simple to replace, and the high braking performance can be administered perfectly in all situations. 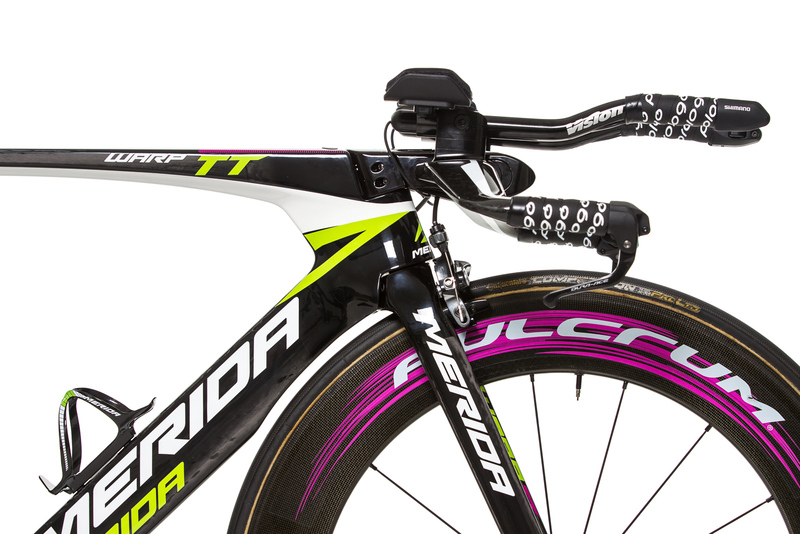 Merida’s own wind tunnel tests show that the externally mounted front brake, combined with the specially shaped fork, has a relatively small aerodynamic disadvantage of 1-2 watts compared to completely integrated or aerodynamically optimized hydraulic brakes. 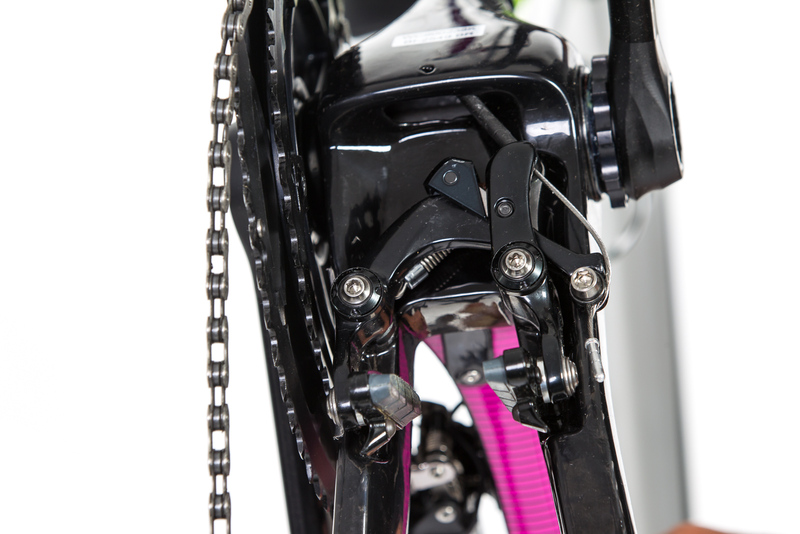 Horizontal dropouts that are typical for TT bikes have an integrated adjustment mechanism. 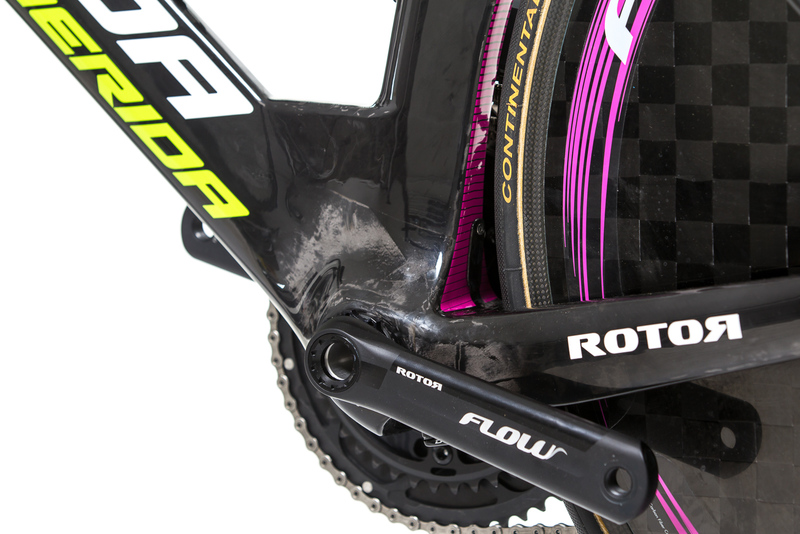 This great feature allows the rear wheel to be moved (depending on the tyre size) as far as possible or necessary (UCI rules) in the direction of the seat tube and to align it perfectly symmetrically. Although I prefer this solution to the fiddly stop using a mini-Allen screw (keyword: wear), a great deal of care must be taken when the rear wheel has been removed that you do not accidentally hit the cogwheel. These are relatively easy to twist when they are not under a load. 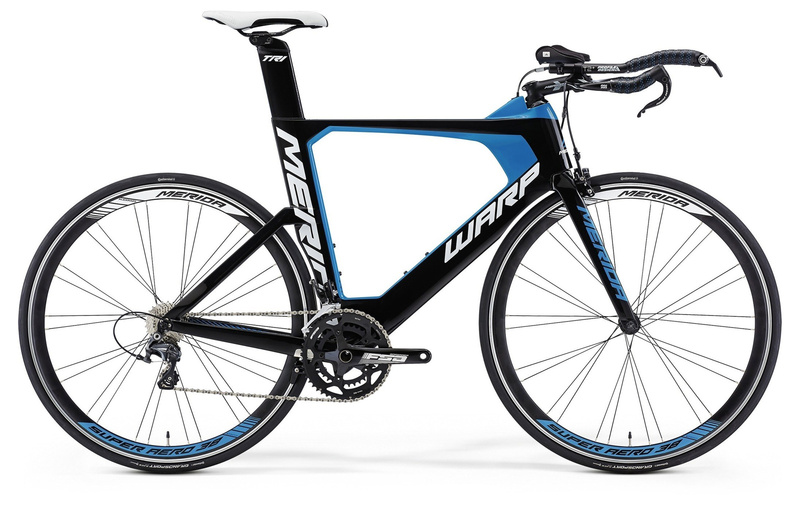 Although the new Warp Tri models are based on the Pro Tour bike discussed here, they do not comply with every UCI regulation. 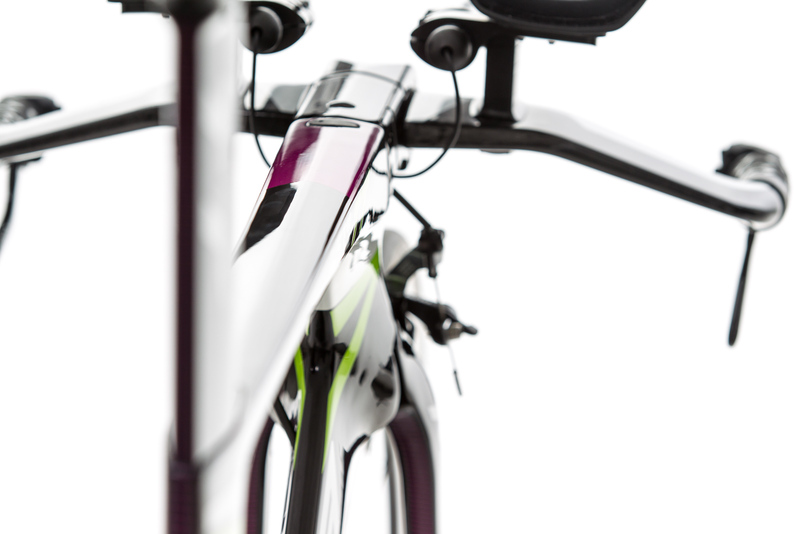 In addition to their high degree of aerodynamics, they dazzle with a geometry that is toned down for use in triathlons and an adaptable modular cockpit. 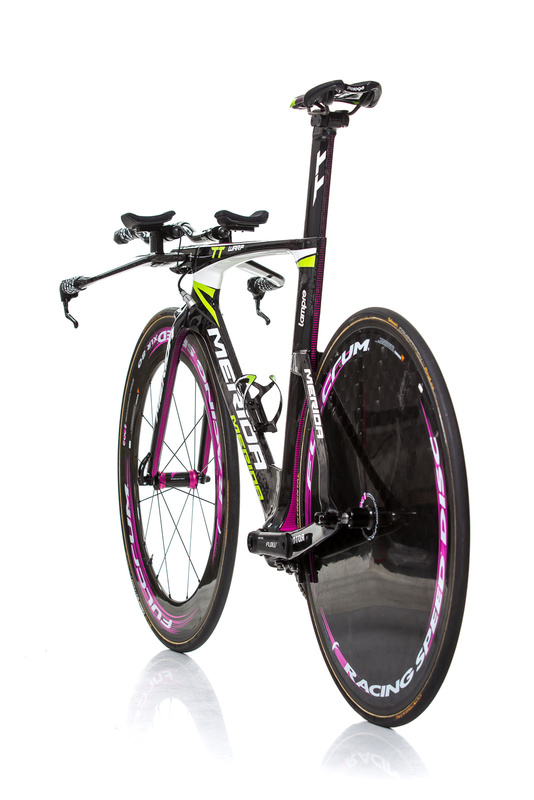 For example, the large seat adjustment range and the high seat tube angle of 76-80° (compare with the TT bike at 74-78.5°) are clearly made for middle- to long-distance triathletes. Above all amateur athletes benefit from the optimised geometry because their performance decreases more with a poor seat position compared with professionals. 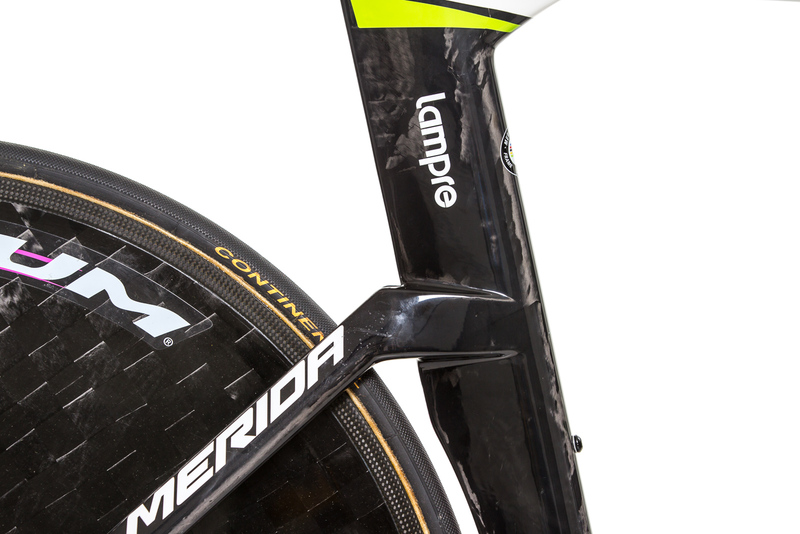 "With the new Warp Tri, we were able to use all the valuable insights that we gained in developing our Warp TT, including the excellent aerodynamics – and without having to implement limiting UCI rules." Another further development from the TT model are the large “NACA Fastback” tube profiles, with their typical drop shape that is truncated towards the back. 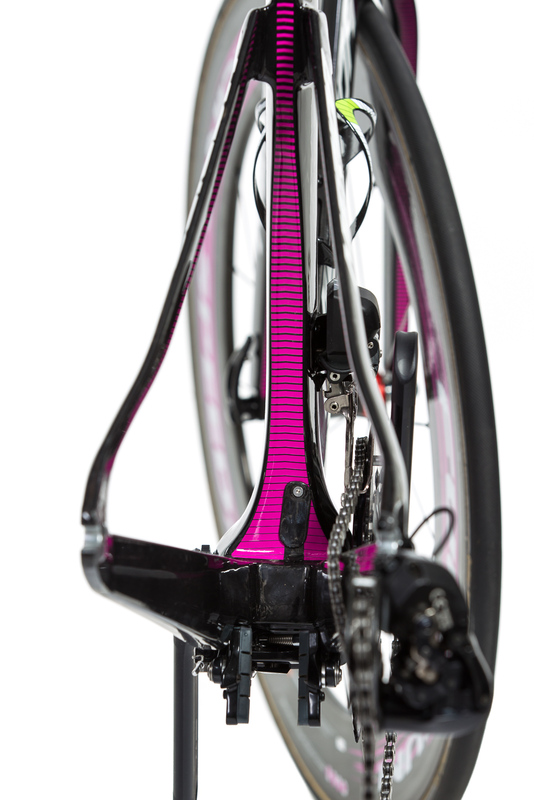 At the front, the extremely slim steering tube provides for little wind resistance. 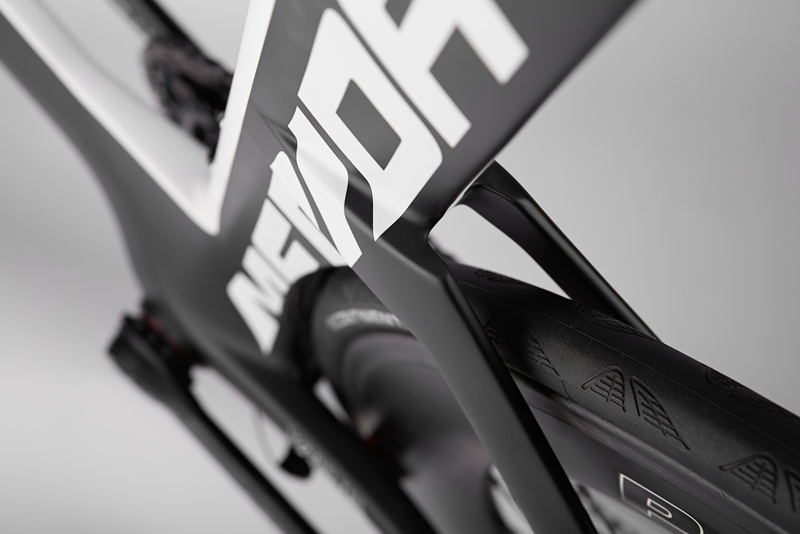 Both the standard Ahead stem and the vertical dropouts that are open to the bottom, ensuring lightning-fast wheel changes, result in increased applicability for everyday and touring use. When we received the test bike via UPS, a cold shiver ran down my spine. 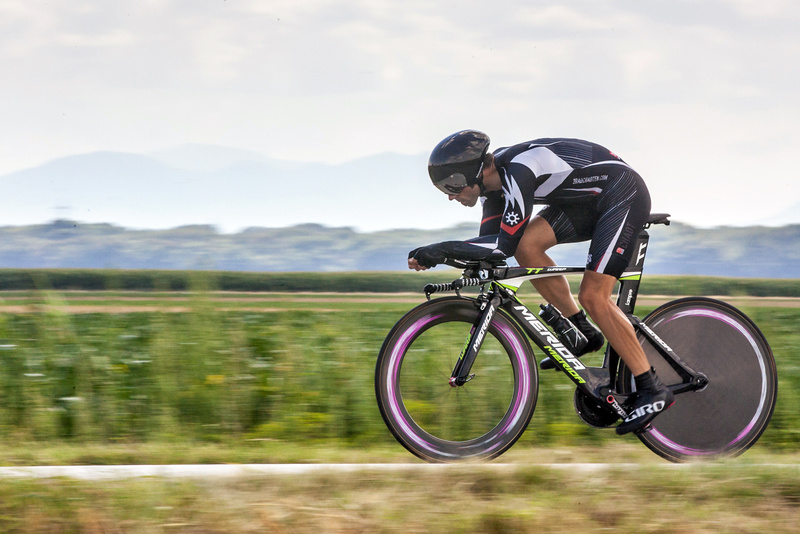 The wounds caused by the previous time trial bike manufacturers X, Y and Z were too fresh, and the positive experiences with the Speedmax CF by Canyon were too valuable. 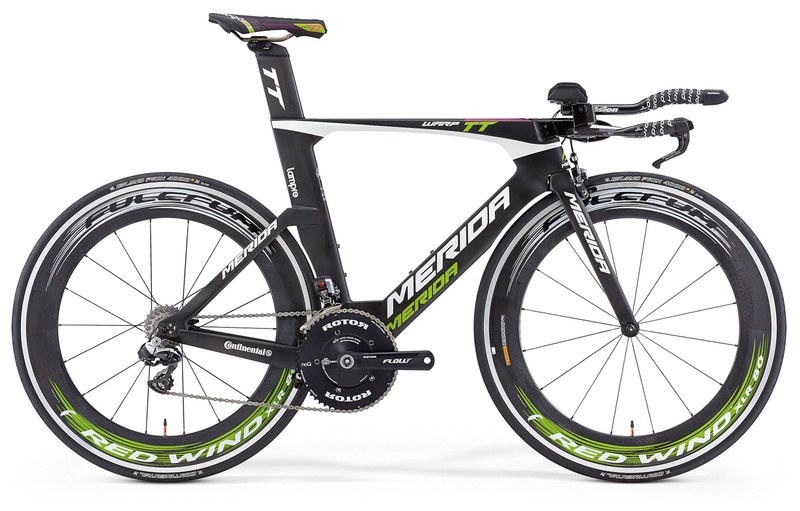 So Merida did not have an easy job of winning me over with their Warp TT. 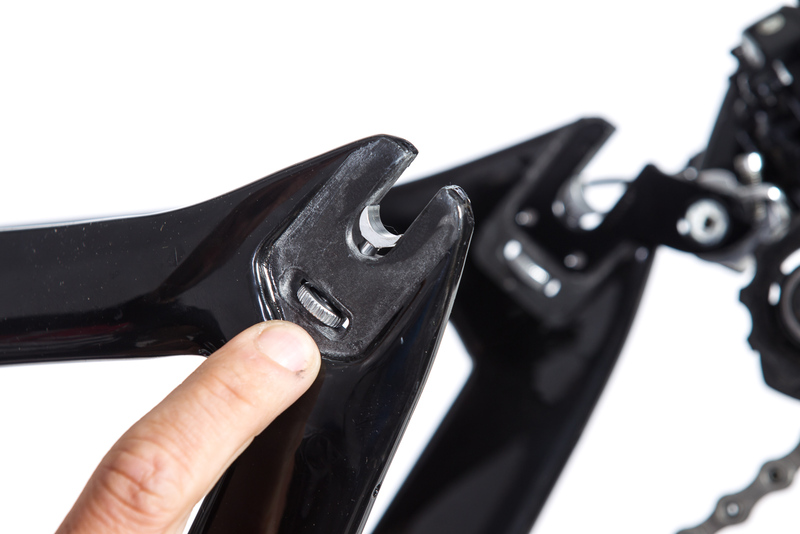 The first positive surprise came in putting it together – attach the handlebar, insert the seatpost, tighten a total of four screws, finished! The fine adjustment of the seat, spacers and extensions also went very quickly. 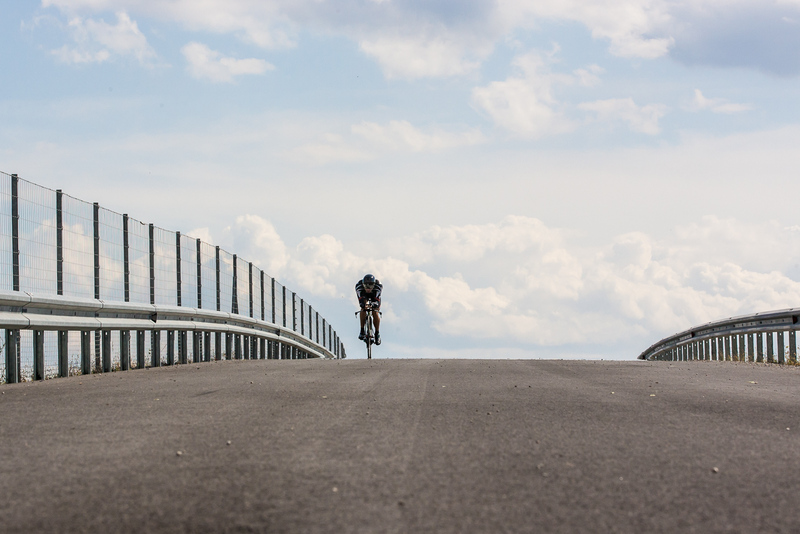 In an instant, my desired position – including taking into account all the UCI rules – had been precisely transferred to the bike, and I took it out for the first long practice session. I especially liked the generally high stiffness of the frame and of the base bar – very reassuring when pedalling super hard, hurrah! Despite this, the frame (rear, bottom bracket) and the cockpit (armpads, extensions) are sufficiently comfortable on bad roads and reduce rough shocks from the road, although the super-rigid and relatively “brittle” ProTeam wheels masked this a little. However, my ZIPP 808 Clincher or the Airstreeem Carbon Aero 85, including 22/24mm tyres, made road handling, rolling resistance and comfort a true revelation. This brings us to the topic of road handling: very agile over short and medium reaches, yet perfect straight-line stability. Even in the tightest corners, there were no problems with the steering – before my first ride, I was afraid that I might fall off in 180° bends due to the limited steering angle. Finally, the topic of brakes: This is just the way one would like it – quick adjustment, lots of bite, good dosing capability and very low maintenance. Highly recommended in everyday riding, for training camps as well as on long distances if the rider is able to endure the aggressive riding position. 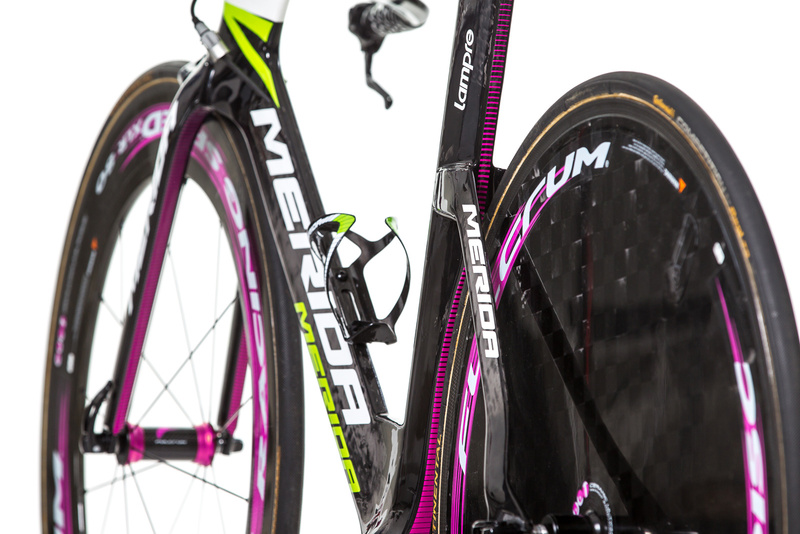 BB rating: The most beautiful and fastest Merida in the world. 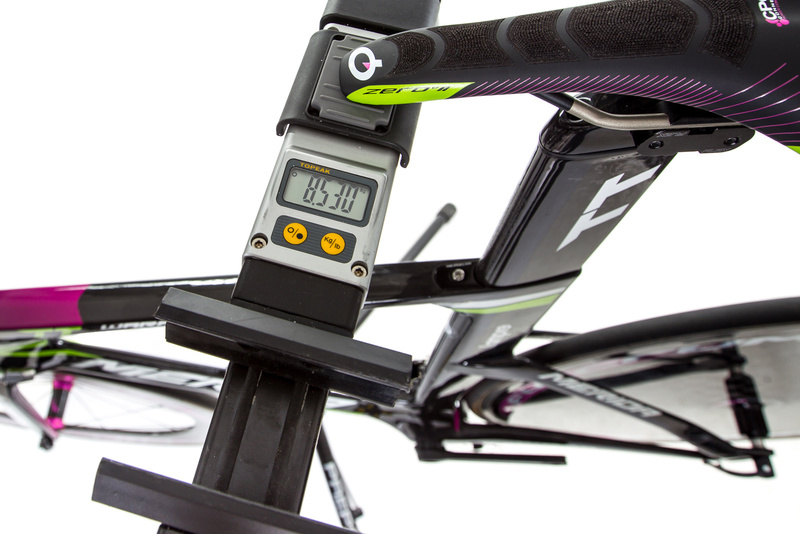 The Warp TT is not only one of the fastest time trial bikes on the market (according to Merida’s own wind tunnel tests and direct comparisons to the competition), it also sets new standards in terms of adjustability. After all, one rides really fast only when one has found the optimum compromise between aerodynamics and biomechanical position. Its riding performance and everyday practicality are outstanding. This uncompromising time trial bike has an integrated seat clamp that produces no turbulence, a specially designed handlebar/stem unit that allows an almost infinite variety of different settings of the cockpit, and many other smart features, such as the “Modular Head”, the adjustment mechanism for the dropouts, the flip-flop seatpost feature, and perfectly functioning Shimano Dura-Ace Direct-Mount brakes. Highly recommended for long workouts, TT races and short-distance triathlons. 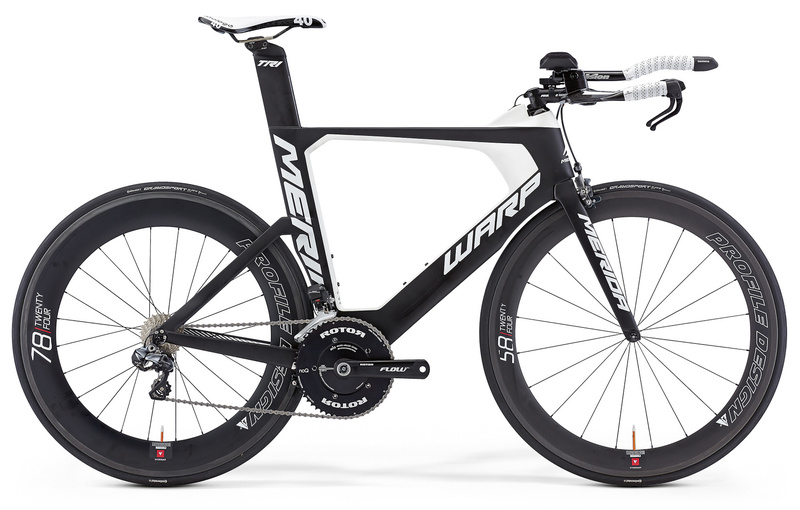 Real triathletes pick the Warp Tri.